It is increasingly being clear that the Servants of the People Society has cheated the Registrar of Newspapers for India in matter of ownership of the Oriya daily ‘The Samaja’ founded by Pandit Gopabandhu Das. It has used a forged Will of Gopabandhu to claim ownership over the paper. We have shown earlier why we suspect the paper’s former editor Radhanath Rath to be the prime offender in preparation of the forged Will of Gopabandhu. Two specific documents have contributed to our suspicion. One: the autobiography of Pandit Nilakantha Das where he has given his eye-witness accounts that before breathing his last Gopabandhu had given dictation of his Will to Radhanath Rath. Two: The biography of Gopabandhu written by Radhanath Rath wherein he has said that Gopabandhu had created a trust comprising ‘The Satyabadi Press’ and ‘The Samaja’ and appointed the Servants of the People Society as the trustee of the same trust. The Will of Gopabandhu, which the Servants of the People Society is using is written by Lingaraj Mishra wherein the trust aspect is conspicuous by its absence. Lingaraj Mishra was a noted man in Gopabandhu’s circle. Though Gopabandhu was not satisfied with his activities, yet he had sponsored him to the Bihar-Orissa Council and recommended him also for membership of Servants of the People Society. So, he was known to everybody close to Gopabandhu. Jagabandhu Singh was one such person whom Gopabandhu was holding with esteem and he was present at the deathbed of Gopabandhu. Had Lingaraj Mishra really taken the dictation of the Will, he being known to Jagabandhu, that could have clearly been mentioned by Jagabandhu in his eye-witnessed accounts. But, writing about the last moment of Gopabandhu, Jagabandhu has written that “somebody else” (Aau Jane) was taking the dictation. That “somebody” was certainly not Lingaraj Mishra. because, Lingaraj Mishra was well known to Jagabandhu and had he taken the dictation, Jagabandhu should have written,‘Lingaraj took the dictation’. Who is that “somebody”? He was, as Pandit Nilakantha Das has said, Radhanath Rath. Rath was just a low-paid servant of Gopabandhu, stationed at Cuttack. There was no reason for Jagabandhu to know him personally and therefore he has not mentioned his name while describing how the Will was noted. Jagabandhu’s eye-witnessed accounts were published in ‘Gruhalaxmi’ vol. III, p.13 and has found place in his biography ‘Jibanalekhya’ at pp.14-15. This makes it clear that Radhanath Rath had taken the dictation of the Will of Gopabandhu wherein he had made a ‘Trust’ comprising the Satyabadi Press and the Samaja and appointed the Servants of the People Society as the ‘Trustee’ thereof under strict condition that the said Society must spend all its income for development of the Bana Bidyalaya at Satyabadi and in socio-political interest of Orissa. 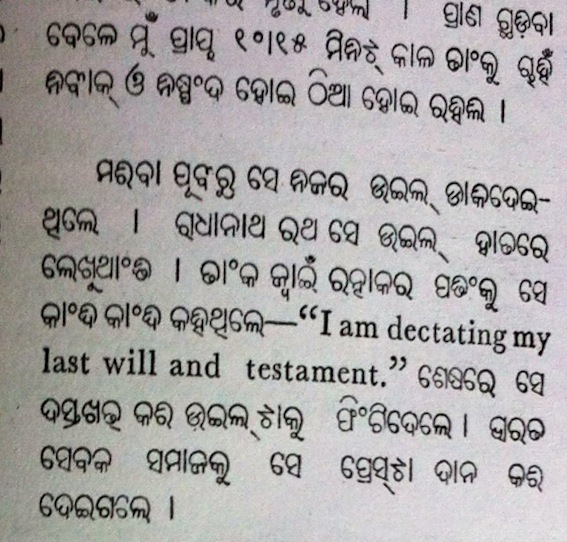 Radhanath Rath has metioned of this ‘Trust’ which is missing in the fair/final copy of the Will reduced to writing by Lingaraj before Gopabandhu signed it. Why so? Obviously it must have occured to him before signing that the Samaja being in the collective control of the panchasakha, he alone cannot push it into a “Trust” and without the so-called “Trust” being registered, SoPS cannot become its “Trustee”. Therefore, when Lingaraj was reducing the draft taken by Radhanath, Gopabandhu had deliberately and consciously ensured that the Samaja shall remain the property of the people, as contemplated by the Panchasakha and shall free the Satyavadi Press to which SoPS should serve as a caretaker under the condition stipulated in the Will. That, only the Satyabadi Press, and never the Samaja, was made over to the said Society is clear in the Society’s resolution of 8-4-1931, authorizing Lingaraj Mishra “to accept the press according to the will of Pt. Gopabandhu Das from the executors of the will”. 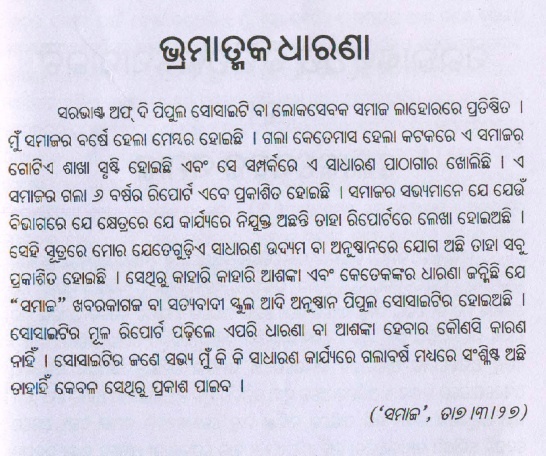 The Will in use by Servants of the People Society is shown as written by Lingaraj Mishra and shows that Gopabandhu had made over the charges of ‘The Samaja’ along with the ‘Satyabadi Press’, contrary to actuals. On the ground discussed above, this Will is fake and forged. In order to grab ‘The Samaja’ under the cover of Servants of the People Society, as I have focussed in my previous presentations, Radhanath Rath had suppressed or destroyed the Will he had taken dictation of and Lingaraj Mishra in nexus with him, had created the Will in use, despite the original Will fair-copied by him from the draft taken by Radhanath and improved upon under orders of Gopabandhu as noted supra having been probated; and both the miscreants had circulated the wrong information that Gopabandhu had made over the Samaja to that Society. Many authors including Sriram Chandra Dash, Nityananda Satpathy, Surjyanarayan Dash, Binode Kanungo and suchlike have helped the lie concocted by Radhanath and Lingaraj about “gifting away” of The Samaja by Gopabandhu to Servants of the People Society spread without investigation into the reality. We don’t rely upon them, as to us, their notings are based on mere hearsay. None of them was present on the spot when Gopabandhu had dictated his Will. The only two eye-witnesses – Pandit Nilakantha Dash and Jagabandhu Singh – had never said it that Lingaraj Mishra had taken the dictation. When the former has specifically said that Radhanath Rath had taken the dictation, the later has made it clear that the man who took the dictation was not known to him by name. It is now, therefore, pertinent to know, if Gopabandhu had ever thought of giving the Samaja to the Servants of the People Society? From what Gopabandhu himself has written, we can say: No, Never. The Servants of the People Society has brought out a Report of six years on various activities its members were pursuing. 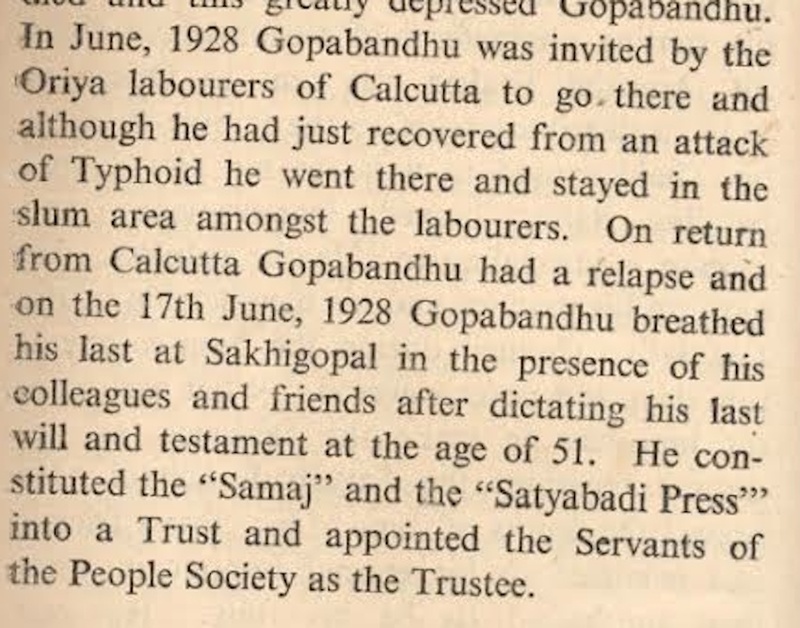 As Gopabandhu was its Vice-President his activities were also mentioned of in this Report. This had misled a few to apprehend that Gopabandhu had given away the Samaja to the said society. In reacting to that, Gopabandhu, in an editorial in the Samaja on 7.3.1927, had declared that the apprehension was absolutely fallacious inasmuch as the report was only indicative of his activities as a member and nothing else. I am rendering below a translation of the said editorial. Servants of the People Society or Loka Sevaka Samaja is established at Lahore. I am a member of this society for about an year. A branch of this society has been created at Cuttack a few months ago and in that connection a public library has been established. A report of this society covering last six years has been published. In this report there is mention of whosoever member has been engaged in whatsoever pursuits. Therefore, whichever public endeavor or institute I am engaged with, has been placed in this report. That has generated an apprehension in some quarters that the newspaper Samaja or institutes like the Satyabadi School have become properties of the People Society. There shall remain no such impression or apprehension if one goes through the original report of the Society. Reading of the report would make it clear that only what I am doing as a member of the Society is mentioned there and nothing else. Two months later in May 1027, in the third installment of his words on Servants of the People Society he had made it further clear that the Society had no investment in or connection with The Samaja at all. So, Gopabandhu, in his own words has made it clear that he had never pledged or thought of giving The Samaja to the Servants of the People Society and the newspaper was to stay the property of the people of Orissa as contemplated by the Panchsakha, which he was heading. Just may be; keep on pl. one day very soon the ‘ORIGINAL WILL’ will appear in these e-pages I am sure. GREAT !!!!!!!!!! !